Combining comfort and flexibility with good abrasion resistance and oil repellence, the Ansell Hynit 32-815 Gunn Cut Nitrile Work Gloves are ideal for protecting hands in a wide range of industries. They feature a palm-impregnated finish for quality oil, grease, and dirt repellence, with a safety cuff for easier donning and improved safety. The product code for the pair of gloves is: 32-815. The Gunn Cut Nitrile Work Gloves offer good abrasion resistance to protect hands from coarse objects, while also allowing hands to remain flexible. The gloves allow hands to remain comfortable while working, protecting them from oil, dirt, and grease without compromise to performance. They also feature a cotton and polyester liner for added comfort, and a safety cuff style for quick and easy donning. The table below showcases the test results of the Ansell Hynit 32-815 gloves according to EN 388 Mechanical Risk specifications. 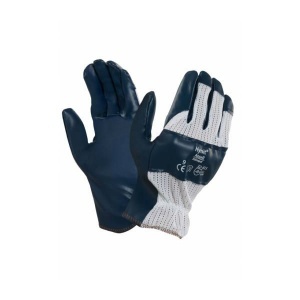 The Ansell Hynit 32-815 Gloves are available in a choice of sizes, making them suitable for most users. Please consult the table below for details, then select the required size from the drop-down menu at the top of the page. The glove length will range from 240mm to 260mm.